I plan to make it through the school year. *I am shopping from my closet. *Dress is business-casual to very casual. BEFORE: From the closet. 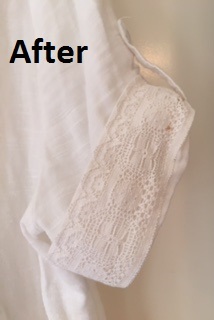 Thin two-layer gauze tunic. Lace from the stash. 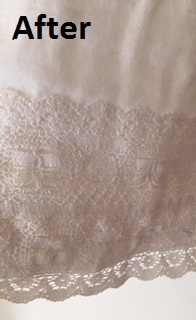 STEPS: Sewed 2 strips of stash lace side by side to make a wider lace. Edged the turned up cuff and the hem. 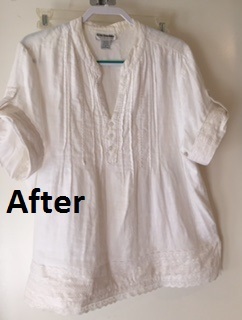 AFTER: Very fast and easy refashion. Worn today with black maxi broomstick skirt. Ha ha, I have seen that 'more lace is better' look around a lot as well. Lace makes everything better. Great job. So Cute, I love the white on white.